Letterpress: How Does it Work? Are you interested in how letterpress works? If you haven't got a printing press and you're not planning to rush out and buy one anytime soon, this is the place for you! If you want practical guidance, that has its own section – there are too many generalisations here to be helpful. In The Letterpress Process, we'll take you through the basic processes and introduce you to some of the vocabulary of letterpress. Individual letters that be arranged to print any word. Setting type in a composing stick. Holding it all in place. Reproducing art work, letterpress style. Including the self inking mechanism found on some presses. Is This a Difinitive Guide? Definitely not! There are infinite variations on the technique – mostly due to differing equipment or personal taste – and our website focuses on how we do things. Vocabulary is often subject to debate, too; again, this is how we use these words and there may be others who think we're wrong. We think that these variations are fascinating, as they reflect the history of letterpress. 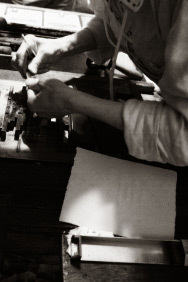 Printers who specialised in different fields used different techniques and different words, and as the Private Presses and hobby printers boomed in the 20th century they took the craft – it's techniques and language – and made it their own. So although opinions differ, it's rare that anyone is really wrong, it's more a case of not how I was taught. There seems to be a gap on the internet between quick, single-paragraph summaries of the letterpress process and in-depth guides for those already up to their ears in ink. We added this section in the hopes of filling that niche. This section is written in as simple language as we could manage because we want to make sure everyone could understand, including the large proportion of our visitors for whom English is a second language.